Nothing Says Fall Like a Hot Cup of Coffee. Just Add Creamer! Fall is finally here! The one must-have to start my day as the air begins to chill and the festivities begin is a hot cup of joe. It’s time to put aside the cold coffee drinks — for now — and sip on body-warming java. Before you take your first sip, elevate your coffee game with one of Hiland Dairy’s fresh and tasty coffee creamers. A splash of Hiland Dairy Coffee Creamer will transform an ordinary cup of coffee into a decadent sweet treat. Talk about starting your day off on a delicious note! Try one of Hiland Dairy’s coffee creamers: French Vanilla, Hazelnut, Sweet Cream, and Fat-Free French Vanilla. In my opinion, these are all winners. You can’t go wrong with a little pick-me-up in the morning! No Hiland Dairy coffee creamer in the fridge? Relax! You can make your own. 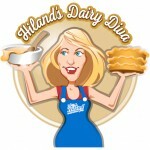 Simply use my Hiland Dairy Creamer recipe.